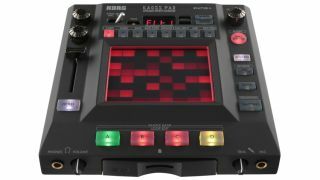 NAMM 2013: Korg's KP3 effects/sampling unit has been treated to a revamp: the KP3+ is based on the same technology as its predecessor but features new effects combinations for you to get busy with. It'll be coming your way in March, though we don't yet know how much it'll cost. Find out more below or on the Korg website. The Kaoss Pad series of effects units is famed for its intuitive touch-pad interface. The flagship model KP3 that appeared in 2006 continues to be highly acclaimed by musicians and DJs around the world for its powerful, instantaneous effect programs and its wealth of sampling functionality. The KP3+ provides new effect programs that are worthy of its status as the flagship model of the Kaoss Pad series. The KP3+ contains a total of 150 programs - 22 more than the KP3. In addition to the 108 effects carried over from the KP3, which include filters, spatial-type effects such as delay and reverb, a grain shifter that freezes tiny pieces of sound and repeats them, and a vocoder, there are 42 new or improved effects that represent today's dance music scene, including effects that were newly developed for the Kaoss Pad Quad, such as the Looper, Vinyl Break, and Ducking Compressor. You can use a side-chain effect to emphasize the backbeats of the kick. In addition to Mod.8 Ducking Compressor, there's a new rEV.1 Pump Reverb that adds a reverb effect. You can add a sense of "breathing" to your music by dynamically varying the reverberation in synchronization with the BPM. We've also enhanced the synth sound effects that are effective when used during a break, bringing them up to date for the evolving dance music scene. Newly added sounds include Syn.3 Pump Noise (noise without resonance, processed by a side-chain effect) as well as Syn.4 Lofi Synth and Syn.9 Resonator. The pad LEDs illuminate along the path that's traced by your finger, letting you perform without difficulty even in a dimly lit DJ booth. We've modified the way that the four sampling bank LEDs illuminate to make them more intuitively understandable than on the KP3; they now light up red during recording and green during playback.